Hakalau Jodo Mission on one acre of land provided by the Hakalau Plantation in Hakalau Upper Camp (aka Up Camp). The current Hakalau Jodo Mission is in the same location as the two story Japanese Language School and Church pictured to the left. Photo from the 1934 book, Light on the Ocean, permission from the Hawaii Council of Jodo Missions. ​The Early Years, 1904-1921: The emphasis of the early years, during the time of Ministers Soma, Suzuki, Matsui and Tachikawa, was building the Japanese Language School, recruiting students and supporting the educational mission. 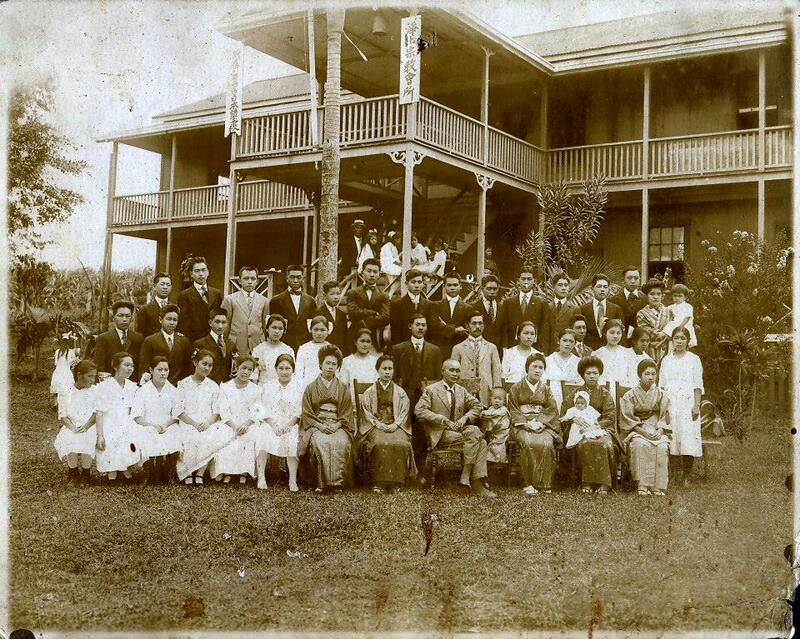 1929 picture of the Hakalau Jodo Mission and Japanese Language School and students from the Waichi Ouye Collection, courtesy of his family. 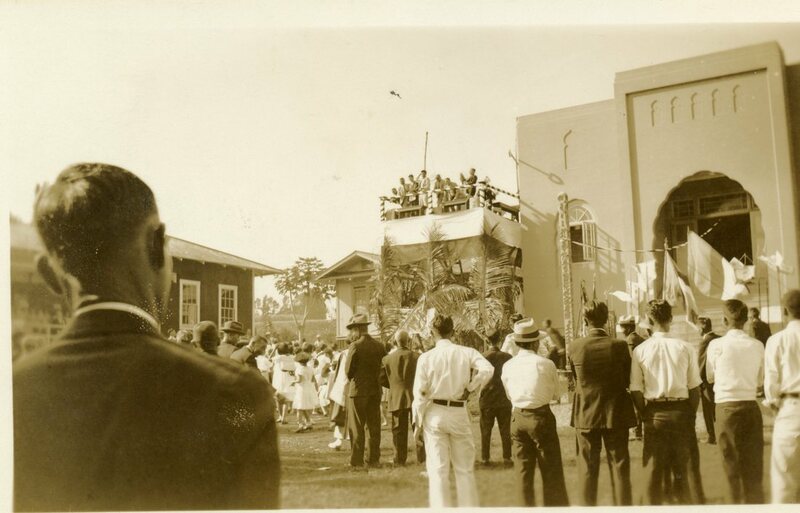 Dedication of the new Hakalau Jodo Mission, December 6, 1936, located on the site of the earlier Japanese Language School and Church. Photo from the Waichi Ouye Collection, courtesy of his family. The Mamiya Years, 1937-1975: During the tenure of 8th Minister Mamiya, community engagement expanded and, after World War II, reflected the diversity of the population surrounding the Mission--Japanese, Filipino, Chinese, Portuguese, Scot, German and others. During World War II, the Mission was closed and Rev. Mamiya interned. After the War, community activities flourished, ranging from baseball, boy scouts, aikido to feeding workers and their families during strikes of the 1940's and 1950's. At the end of 1962, Hakalau Plantation ceased to exist as a corporate entity and the camps, sugar cane lands and production facilities became part of Pepeekeo Sugar Company. In the 1960's and 1970's, camps were dismantled, and homes sold on a removal basis. Church members moved to Pepeekeo, Hilo and elsewhere. Church membership declined as the population moved away. ​Nevertheless, the commitment to support the community remained strong. 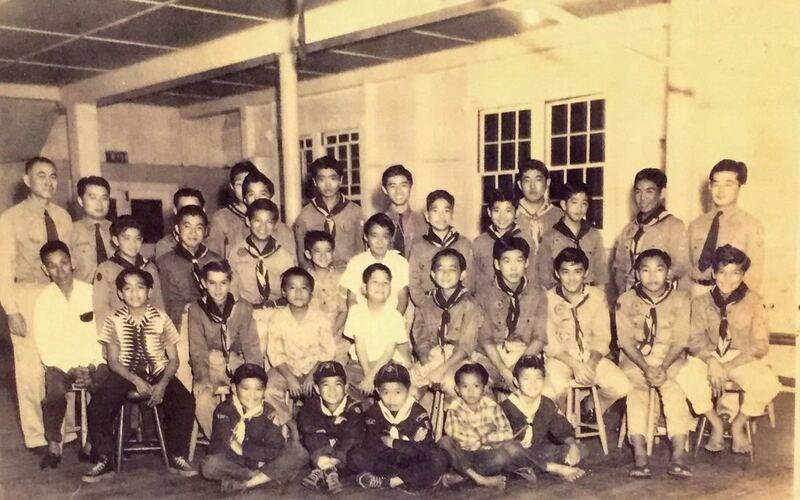 Boy Scouts in the Hakalau Jodo Mission Social Hall, circa late 1940's-early 1950's. Scout Master Toraichi Morikawa at far left. 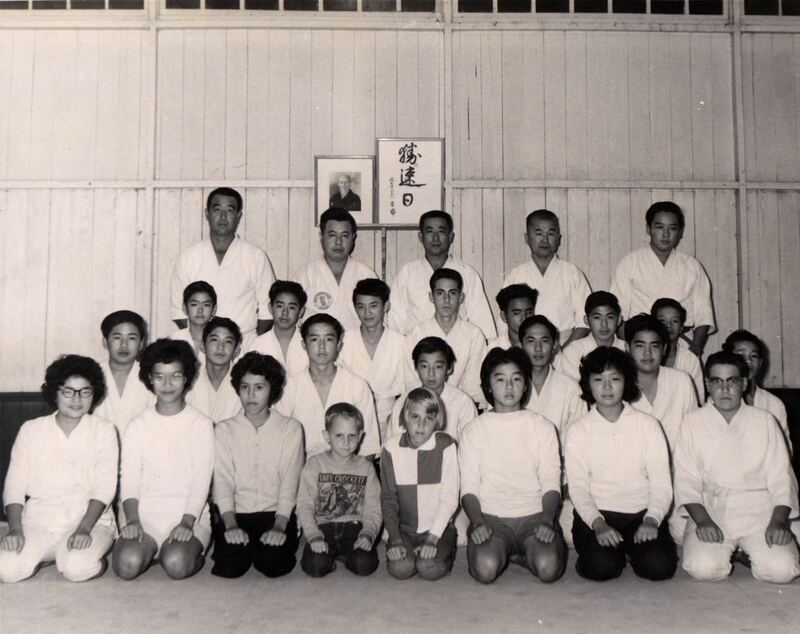 Aikido class run by Takashi Nonaka and Takashi Yugawa sponserd by the Hakalau Jodo Mission, circa 1963. From the Waichi Ouye Collection, courtesy of his family. ​​The Later Years, from 1975-present: Dismantling of the plantation community continued and Church membership dwindled during the time of Ministers Tanaka and Tamura. The Big Island sugar plantations closed. 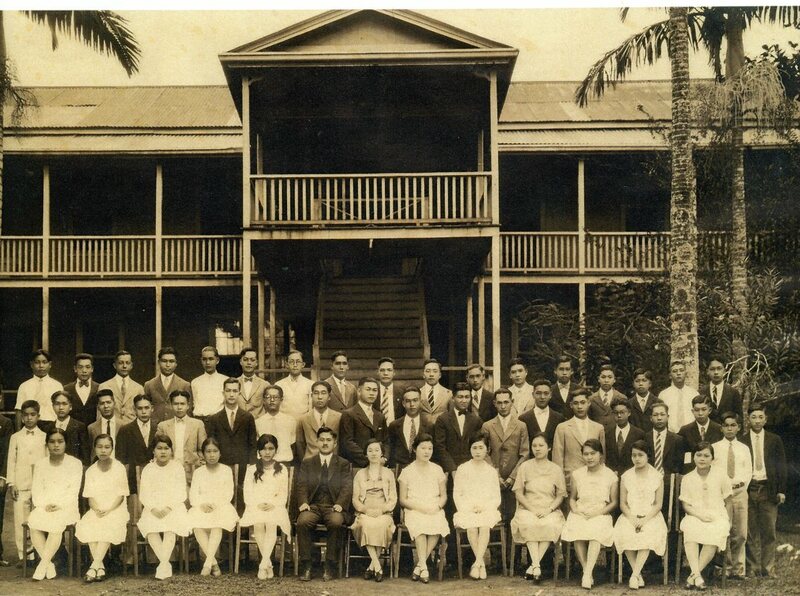 The Hakalau Jodo Mission transitioned from a full-time minister to a part-time minister, with Minister Sawaguchi serving as the last resident Minister, followed by part-time Ministers Wansa and Miyazaki. Nevertheless, the commitment to the community continues. New neighbors have moved into the area offering new opportunities for community engagement. A short history compiled by the 10th minister, Tamura Hakushi (1979-1996), details the history from the first minister through the tenth and are included in their entirety in the detailed sections on each period. Light on the Ocean, published in 1934, celebrates the Hawaii Jōdo-shū, acknowledges the hard work of members, and encourages continued effort. Most of the content from this translation is included in the detail relating to the Years between World Wars. 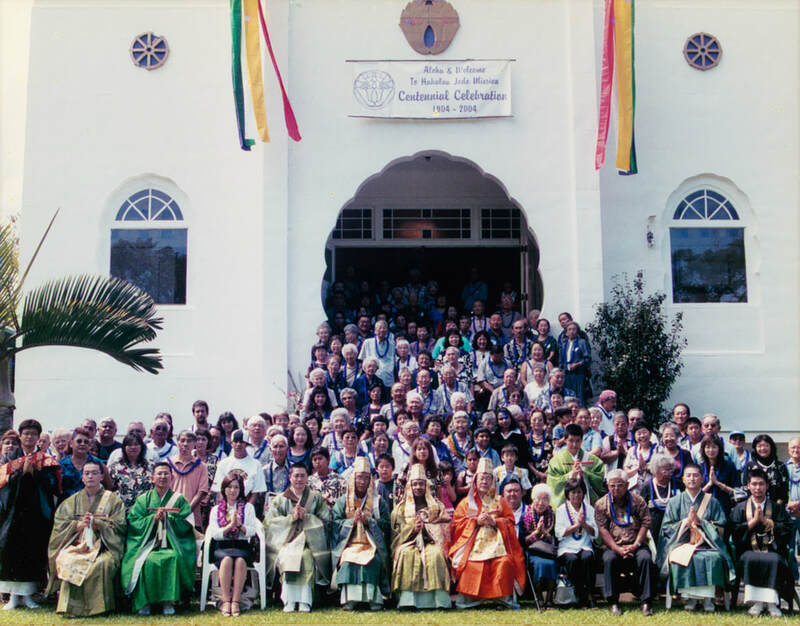 ​Both historical documents were translated by Yumiko Bamba, in consultation with Rev. Junshin Miyazaki. We are grateful for their work. In addition, Dennis Ogawa's book on the Japanese American Experience in Hawaii, Kodomoa no tame ni: For the sake of the children, provides a vivid description of the social and political context in which the Japanese in Hawaii lived. The history of the Hakalau Jodo Mission reflects the changing environment described by Mr. Ogawa.